From a simple experiment with a couple of Pacific coast tide pools, one artificially deprived of its top predator, a type of starfish, by a researcher and quickly overrun by a single species of mollusk, to an examination of the complicated interplay between sea otters, sea urchins, kelp forests, and whales, to a searing indictment of game management practices that have left much of the Eastern United States overrun by whitetail deer, Stolzenburg demonstrates over and over the ecological mayhem that results when top predators are removed from an ecosystem. Though the pattern quickly becomes familiar, the unfolding of new discoveries and new mysteries as each story builds keep the account not only interesting, but gripping. When top predators are removed from an ecosystem, the smaller predators and herbivores take over the role of top dog, with disastrous results for other animals and plants alike. For example, the kelp forests of the Pacific Coast shelter hundreds of species of fish, mammals, mollusks, and other creatures. When sea otters were removed from the equation by 19th century fur trappers, however, kelp forests along much of the coast were devoured by an ever increasing plague of sea urchins, the otters’ favorite food, driving other animals who relied on the kelp for shelter or food away. When otter numbers recovered after they became a protected species, the kelp forests returned, and so did coastal biodiversity. Predators, in short, are “keystone” species – species that by their very presence increase the diversity and stability of they ecosystems they reside in. For those who don’t value biodiversity for its own sake, Stolzenburg demonstrates the costs of ecosystems made simplified and denuded by the removal of large predators best in his discussion of the deer problem plaguing much of the Eastern US. Anyone who tries to live and garden in rural or suburban areas of the East can attest to the troubles posed by ravenous herds of deer. Many gardeners are forced to rely on “deer-proof” plants, which are often non-natives, some of them invasive. Deer are also responsible for hundreds of collision related deaths and injuries on Eastern roads, and the rise in their numbers coincides closely with a startling rise in cases of Lyme disease among Eastern residents, a disease spread by the deer tick. Though human hunters have made inroads into the problem of deer overpopulation and Stolzenburg believes that certain hunting restrictions should be relaxed or revised, he does not believe that human hunters should be the only solution. Humans tend to take large animals in their prime, depleting the gene pool, while predators typically take the very young, the very old, and those who have been weakened by injury or disease. Predators also demonstrate more beneficial effects on the behavior of prey species. For example, the riparian zones (stream banks) of Yellowstone, a biodiversity hotspot, are rapidly recovering from decades of trampling and overgrazing by elk because elk, under assault by wolves, now avoid these areas, or pass through them quickly because elk are more easily overtaken by wolves on steep stream banks. With plant life recuperating as well, the dangers have doubled – streams are also prime ambush sites. Like many works on conservation, Stolzenburg mixes optimism and pessimism in sometimes unequal quantities. Arguably his most optimistic chapter concerns the reintroduction of wolves to Yellowstone, a long and difficult battle that has brought triumphant results both for Yellowstone’s biodiversity and its local economy. The end of the book is somewhat weaker than the beginning and middle. It includes an interesting and mostly positive exploration of the concept of Pleistocene Rewilding, a conservation proposal I find intriguing but ultimately fanciful and possibly unwise. With a few exceptions, most notably the Pronghorn, evolution has moved on since the Pleistocene (the modern American bison, for example, has existed in its present form only about 5,000 years) and I don’t necessarily see the value of reintroducing near-relatives of old natives, especially since these, too, have evolved and adapted to fit their own habitats since the days of the last Ice Age. Stolzenburg ends with a plea for tolerance and predator-friendly wilderness management. 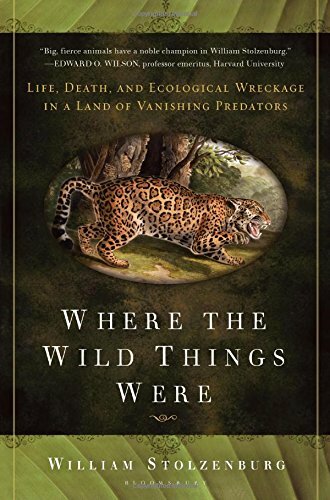 “The great predators,” he writes, “are barometers of our maturity as a species.” His book will leave you enlightened about the true importance of the role predators play, and inspired to join the fight to restore them to their rightful place.